This is such an honor to be selected for the Follow Friday Feature on Parajunkee's site. Thank you so much PJV. Follow Parajunkee (our host) and make sure you click to the right and Follow us and then take a look at these WONDERFUL blogs below and follow them. Let them know in the comments on their Follow Friday that you followed. There are really great sites below. 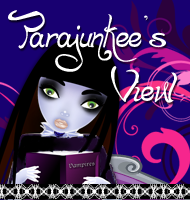 VISIT PARAJUNKEE (use the link/pic above to add your name to the list and check out some of the 200 blogs) - showing a few below...there are GREAT BLOGS on the list !!!!!! 19. Christina @ Books Are Life! You've got a gorgeous site, and I'm happy to be a new follower. Congrats on being the featured blogger. I'm a new follower. Have a great weekend! Just hopping by to say hello! I am following and can’t wait to read more from your blog. Here is my Follow Friday post it also features the giveaways I am currently hosting on my blog! I'm a new follower via PJV! Great Blog you have here! Congratulations on being the featured blog. I'm not sure if I am supposed to sign up on your Mr. Lnky and Follow Friday's linky but at any rate I couldn't get yours to work...don't know if that is a sign. New follower.